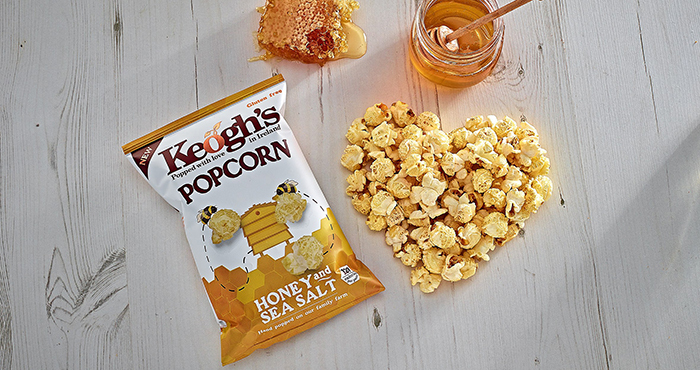 Synonymous for their tasty farm gluten-free cooked crisps, this spring sees the arrival of Keogh’s Premium Popcorn. We hear it’s hand-popped and quite the mouthful – rounder, cruncher and tastier! High in fibre, gluten free, lactose-free, non-GMO, vegetarian friendly with a vegan option too, Keogh’s popcorn is handpopped on their farm using wholegrain premium corn and seasoned with natural flavours. Those who like the combination of sweet and savoury will love Keogh’s Irish Honey & Sea Salt flavour made using Irish honey from Keogh’s very own beehives, and finished with just a sprinkle of Irish Atlantic sea salt. Other flavours include Irish Atlantic Sea Salt, as well as Sweet Chilli & Cherry Tomato! Small plots of corn have been planted and grown on the Keogh Family Farm, however, the family is also partnering with small family farms in Indiana to grow premium corn varieties that produce rounder crunchier popcorn and carry as much natural flavour as possible. Visit www.keoghs.ie for more details. To celebrate Keogh’s new foodie adventure, we’re giving away three hampers! Enjoy a movie night in with your friends or family by winning a hamper containing three sharing bags of each fabulous flavour. To enter, simply fill in the form below.